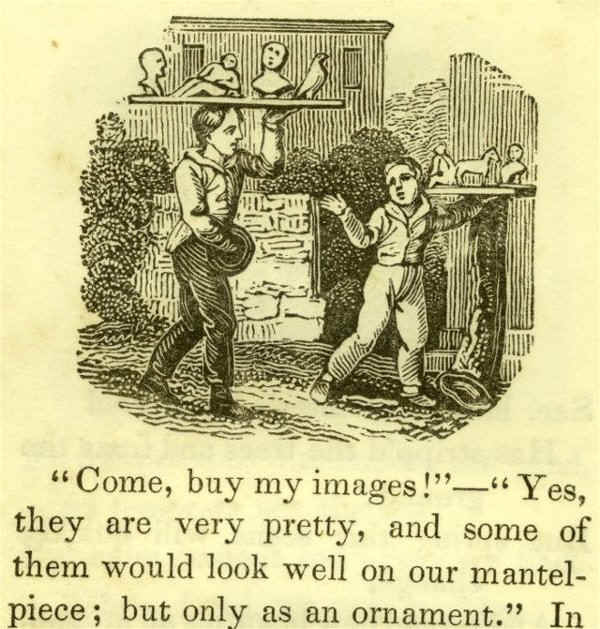 Every generation has had its love of sentiment, even though we usually heap most of its glory on the Victorians. 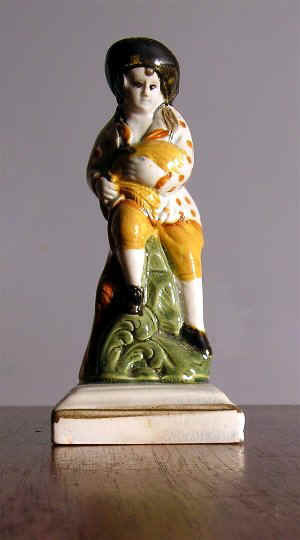 One of the more charming outlets for Victorian emotions is the Staffordshire figurine from the 19th century. 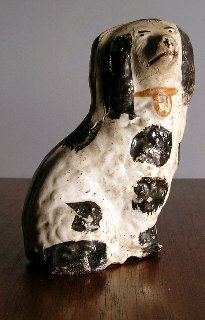 The idea of miniature people and animals cavorting around in pottery or porcelain had been well established in the previous century by all the better potters. Careful modeling and colouring made for quality pieces, often based on popular poems and plays. 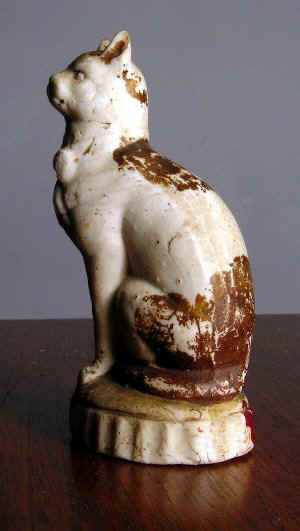 By the 19th century, with the growth of the middle classes, more statues were needed with a cheaper manufacturing cost. Generally, quality declined as one approaches the end of the 19th century, as earlier labour-adding steps were eliminated. 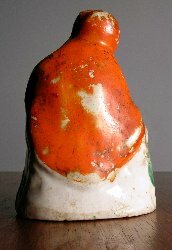 Between 1840 and 1850 the potters used a refined body, slightly transparent in places. A striking, rich, dark-blue was brushed on under the glaze (left & rear view below left; photo: J. McKendry©) . Buttons and so on were painted in gilt; however, this was rare after the 1860s as it necessitated an extra firing and hence extra expense. The earlier gilding needed burnishing, but after 1880 they changed to bright gold - a thin, bright gilding. 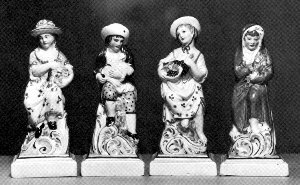 After 1850 the figurines have a flat undecorated back, called flat backs, with a narrow oval bottom for standing on a mantel or dresser ( above middle; photo: J. McKendry©. 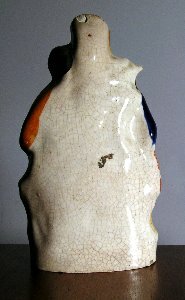 The earlier pieces were modeled and decorated all around, on a circular or square base (above right; for front view, see Autumn from the Seasons, below; photo: J. McKendry©). Eliminating half this modeling allowed a simpler process and again less expense. 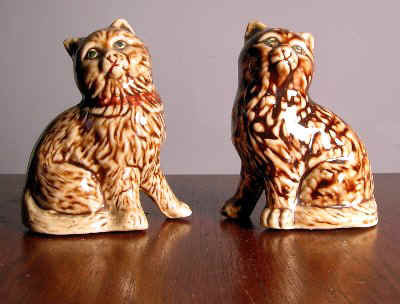 The earlier pieces have a deeply recessed base (left, see Early Cat below, photo: J. McKendry©) when you turn them up to look at the bottom, but later they are only slightly recessed (right, see girl in red cape below, photo: J. McKendry©). 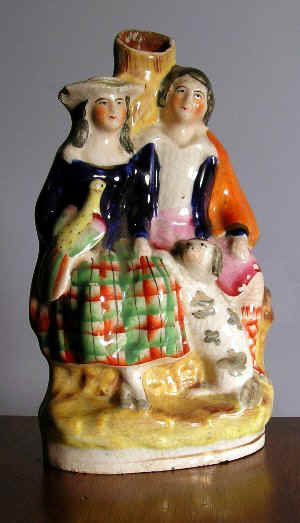 These Staffordshire figures are still being made today. You can hopefully distinguish the age by the construction. 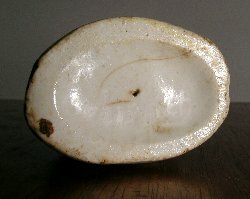 The Victorian potter pressed thin bats of moist clay into a two- or three-piece mould and, should the piece be broken, you could see finger impressions inside. 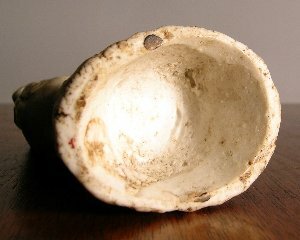 However, they normally closed the base with extra clay, often leaving a small hole left to allow air to escape during the firing (right, see Autumn from the Seasons below, photo: J. McKendry©). 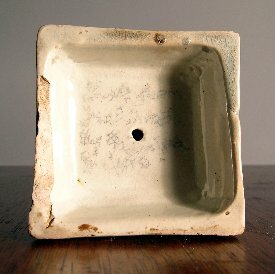 The modern method is to pour slip-clay (thin clay) into a plaster-of-Paris mould. The latter absorbs some of the water and leaves a clay wall inside. Excess liquid is drained away. Through the large hole left in the bottom you can see that the interior of the clay wall is smooth (right, see Pair of Cats at bottom of page; photo: J. McKendry©). 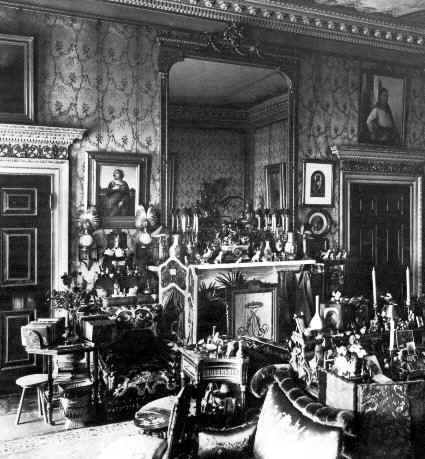 The brushwork of the Victorian decorator was free and lively, while the modern one seems lifeless and too detailed in comparison. In applying these generalizations to the charming group illustrated here of a kiltie boy, a girl with plaid skirt and sash, a tame bird and loving spaniel, one observes the rich, dark blue colors, the burnished gilt, the spontaneous and vivid brushwork (orange, green, blue, yellow, pink), the oval base, the flatback, and the deeply recessed bottom (right, 8½ in. high, photo: J. McKendry©). Therefore, one concludes that it was made around 1850-1860. There are no identifiable makers marks, as usual. 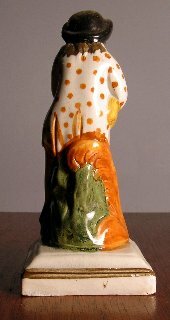 This figurine apparently was made to hold flowers, perhaps dried ones. You can also find strange looking watch-holders. 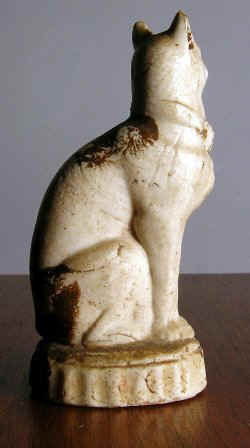 Perhaps this particular figure illustrated a poem or theme. Does anyone recognize it? 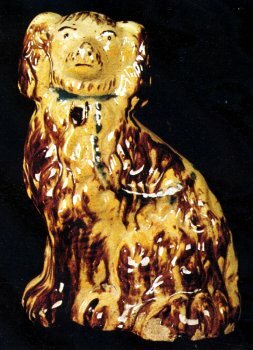 Staffordshire dogs pre-1850 sat on rocky or some other type of base, but post-1850 had no stand or plinth (left, miniature, 3½ in. high, photo: J. McKendry©). In the 20th century, glass eyes are inserted. The same process of manufacturing for the figurines applies here. 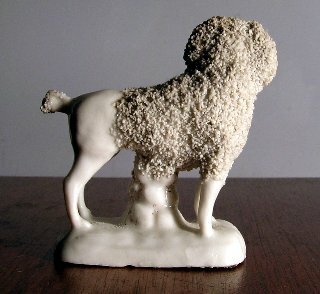 The favourite type of dog is the King Charles spaniel, greatly beloved for the 1880s parlour decor. 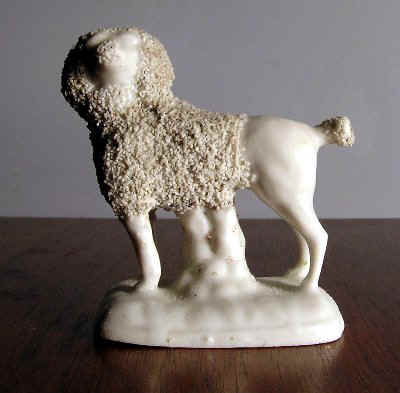 This dog was brought into fashion in England with the Restoration of the monarchy in the 17th century under King Charles II, and hence fit into the Victorian pattern of revivals. 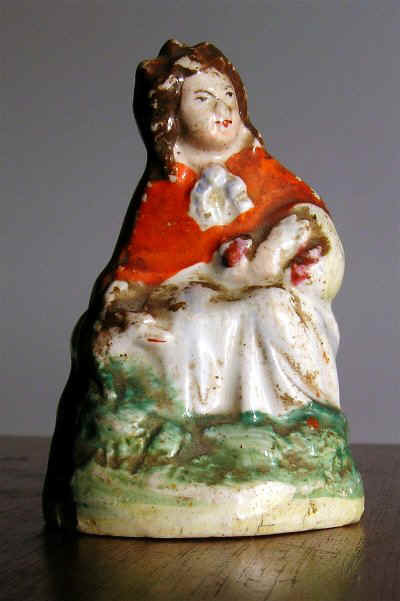 The vast majority of figurines found in Canada were produced in the Staffordshire part of England and imported throughout the 19th century for sale in the colonies. 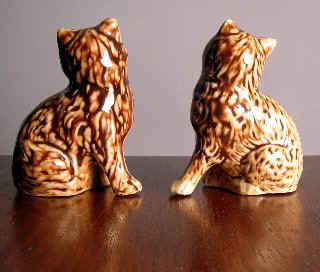 Pairs of dogs were also made at many potteries in Canada, for example in Bowmanville, Ontario, in the mid 19th century and Markham, Ontario, in the 1870s and early 80s (right, 8¾ in. high). 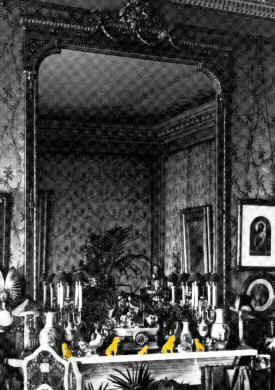 A posh English parlour c1890; on the right is a detail of the mantel shelf, on which sits a pack of dogs (highlighted in yellow). Faced this proliferation of ornament, certain avant-garde designers advocated for a more restrained display of quality Oriental pottery. 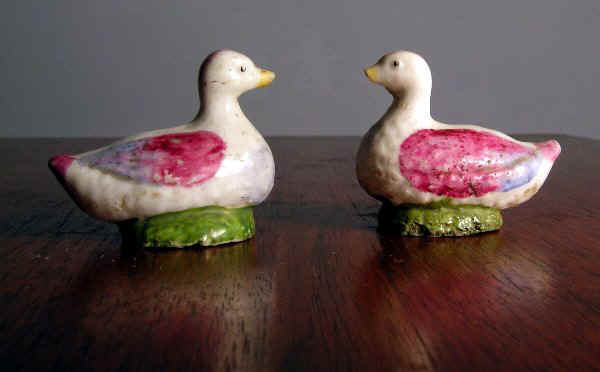 The love of Staffordshire figurines started to fade away in the 20th century.